New Delhi: The rainfall during the June-September monsoon season in the country was ‘below normal’ and quantitatively 91 percent of the long period average. The problem of moisture stress on the Rabi crop in the southern states was aggravated by the 43 percent deficit winter rains. The country had over January and February got 22 percent more than the average rainfall in 2019, with the highest quantity in these two months seen in the past five years. The rainfall was well distributed and timely, except in few areas of Gujarat, Karnataka and the north-east region. The states of Andhra Pradesh, Maharashtra, Rajasthan, Gujarat, Jharkhand, Odisha and Karnataka are severely affected by drought. Deficient northeast monsoon rains and dry conditions led to decline in sowing of Rabi crops by 4 percent. 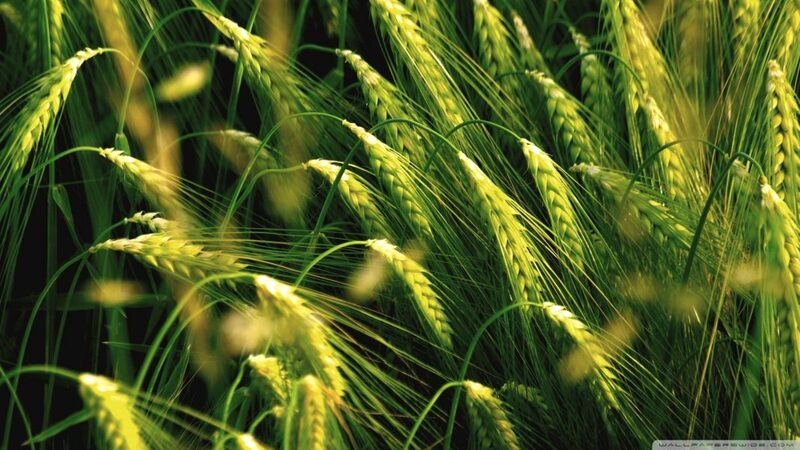 Keeping in consideration the large scale post monsoon deficiency and other agro-climatic developments in various parts of the country, National Bulk Handling Corporation has come up with its Final Rabi Crop Estimates for 2018-19. 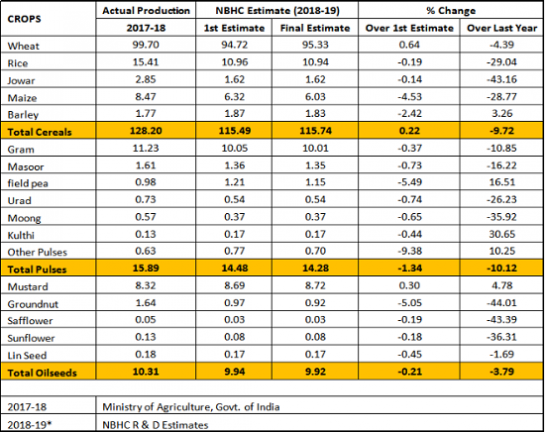 In its first estimate (First Rabi Crop Estimates for 2018-2019), NBHC had broadly concluded that in the year 2018-19, the production of total cereal, pulses and oilseeds are expected to decline by 9.72 percent, 10.12 percent and 3.79 percent over 2017-18. In the current assessment, the Pulses and oilseed have marginally pushed themselves further in the negative region with an expected decline of 1.34 percent and 1.59 percent over the last estimate. For the year 2018-19, as Scanty rainfall resulted in significant fall in sowing areas of major crops in states of Gujarat, Maharashtra, West Bengal, Rajasthan, Karnataka, Andhra Pradesh, Telangana and Tamil Nadu. Wheat production is expected to increase marginally by 0.64 percent over last estimate amidst reports of higher yield in Northern India but would still be lower by 4.39 percent over last year mainly because of drop in sowing in drought-hit Maharashtra and Gujarat, as well as West Bengal. Rice production is expected to fall further by 0.19 percent over last estimate leading to overall decline of 29.04 percent over last year due to a drop in rice cultivation in Tamil Nadu, Telangana and Andhra Pradesh. Maize and Jowar production is expected to decline further by 4.53 percent and 0.14 percent respectively over last estimate leading to overall fall in production by about 28.77 percent and 43.16 percent respectively over last year. Pulses production is projected to drop further by 1.34 percent to 14.28 million MT than last estimate of 14.48 million MT, which is 10.12 percent lower than last year’s production of 15.89 million MT. This is mainly due to 10.85 percent drop in the gram production, which constitutes about 70 percent of the total Rabi Pulses. Gram production is expected to decline further 0.37 percent over the last estimate mainly due to fall in Madhya Pradesh and drought-hit states of Maharashtra and Karnataka. Urad and Moong are also expected to decline by 0.74 percent and 0.65 percent respectively over the last estimate. Total oilseeds production is estimated to be 9.92 million MT, which is about 0.21 percent lower than the last estimate mainly because of groundnut production, which has been seriously hit by adverse weather conditions, particularly in Gujarat. Groundnut, Safflower, Sunflower and Linseed production is expected to decline 5.05 percent, 0.19 percent, 0.18 percent and 0.45 percent respectively over last estimate. Mustard production is expected improve further by 0.30 percent than last estimate to 8.72 million MT – an overall increase of 4.78 percent over last year due to favorable weather condition resulting in higher yields in major producing states.